Our first #graphicmonday on the relaunched site is one of Leslie’s, a Tableau-based interactive on the collapse in asbestos exports. Have a look. #graphicmondays migrated from the previous site can all be found here. The whole globalnews.ca group of sites relaunched this morning with a responsive-design system on the front end and WordPress VIP on the back end. It went about as smoothly as these things can. Most of the last week or so was spent on making our interactive projects from the last year or so work in the new system. We had a lot of fun putting together this interactive on singles, conception dates, and sexually transmitted infections. There are a lot of nice maps and interactive graphics, all wrapped up in a Tableau package. Aside from being a fun feature for Valentine’s Day, it was also an experiment in using Tableau as a navigation tool for a complex, multifaceted feature. It was great to find out that you could embed Fusion Tables maps into Tableau. It’s also cool that you can use Tableau to essentially set up a slideshow between elements. It’s not the neatest tool for navigation though, and it’s really unnecessarily complex to create buttons that let you move between slides. In the end, it was a lot of work. I’d try it again, but probably for something a little simpler and with a little more time to prepare. And yes, we purposely released STI maps on Valentine’s Day – or VD, as some people on my Facebook feed are calling the holiday. A story/interactive package I’ve been working on for a while went live yesterday – a look at the very depressing job situation for freshly trained Ontario teachers, and how the production of new teachers got badly out of whack with teacher retirements (teacher education was expanded in response to what turned out to be a temporary surge in retirements in the late ’90s, and is just now being scaled back). In turn, graduates of Ontario universities are showing much less interest in going to teacher’s college. Under the circumstances, it’s hard to blame them. I find myself often referencing income maps, in one way or another, when mapping other things (Toronto’s male-victim homicide map, for example, tracks the city’s low-income neighbourhoods fairly precisely). So it’s helpful, once in a while, to publish the income maps themselves as a reference point, which brings us to this week’s #graphicmonday. Since Fusion Tables can display FSA-based maps covering the whole country, it’s now possible to publish a hyperlocal map like this on a national scale, in this case a one-stop-shop map of median family income by postal area. The story also has a list of Canada’s ten poorest and ten richest postal code, in some ways surprising, in some ways not. No, we weren’t late posting this week’s Graphic Monday. But, we were a little late posting it to the Tumblr. Sorry! I hope you’ll enjoy it though. This week, we used some new Statistics Canada data to put together an interactive graphic of the health problems of different Canadian cities. 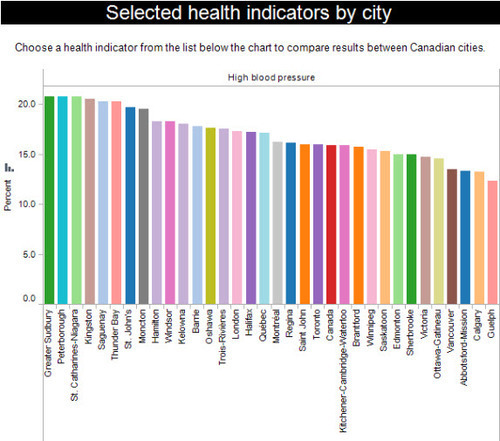 Sudbury and Peterborough, for example, seem to have serious problems with diabetes and high blood pressure.